The cold night fades away to the warmth of morning as the sun rises above a city skyline. Within the towering structure of a high-rise apartment lies a man named Jacob. He slowly wakes as the light of day seeps through the custom blinds of his bedroom window. He sits on the edge of his bed staring at the breaking dawn, taking in the beauty of a new day. It is his day off; the first one he has had in several months. He closes his eyes and breathes deeply, taking in the moment as if it were his last. Believing the day as too good to waste, Jacob decides to go for a drive. The roar of his black sedan is like music to ears. The exhilaration, the freedom of the open road rejuvenated his spirit. During his joy ride, he decides to stop and eat at the new Chinese restaurant in town. The decorum inside was ancient mandarin in nature, the walls of the building seem to run on forever. He sees a sign that says, “Open Seating,” and finds him a table. A beautiful woman greets him with a menu and smile. Jacob orders his meals by the numbers and before long; his table is full of fine cuisine. He eats with a ravenous hunger like there is no tomorrow. “Is there anything else that I can bring to you,” the server asks as she clears the table. “No thank you,” Jacob replies, wiping his mouth with a cloth napkin. “I will be right back,” she says to Jacob, with a friendly smile. The server returns and places a plate of fortune cookies on the table. Jacob grins as he takes one of the cookies. He cracks it open removing a fortune that reads, “You are going to die soon,” he begins laughing, “Not what I would call a fortune,” then opens another cookie with a fortune that read, “Stop Laughing.” His laughter becomes a cough from the startling effect of the second fortune cookie. “Not funny,” he thinks to himself. Jacob carefully looks around the restaurant for familiar faces, to see anyone he knows who might be either pulling a prank or want him dead. “Too many people,” he thinks to himself, wiping the sweat from his hands and forehead. He sees that there is a third fortune cookie on the plate but unwilling to open and read the fortune. 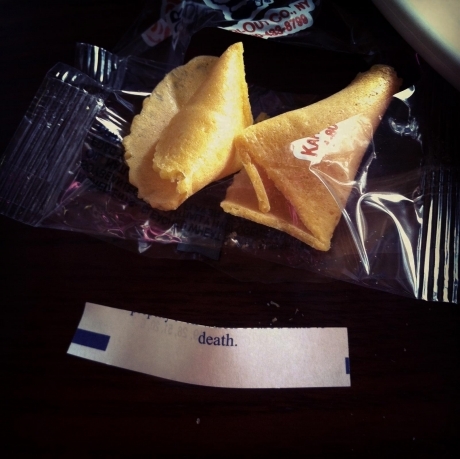 He puts the last fortune cookie in his shirt pocket, places cash on the table and leaves the restaurant. The server sees him leaving and yells, “Have a wonderful day.” All he can do is shake his head. Jacob hurries to his car, as he approaches the driver’s side door; he hears a faint beating like the rhythm of a hollow drum. His vision becomes blurry, as the sound of the beating grows louder. Knees buckling as he falls to the ground. Jacob’s world slowly fades to black. Jacob lays back, closes his eyes and smiles.